10 years ago: The Bocca Nuova, a photo by etnaboris on Flickr. On 30 January 2002, I climbed to the summit craters of Etna with two friends, on a rather mild, sunny day with almost no snow. Five months had passed since the spectacular eruption of July-August 2001, which had mostly affected the south flank of the volcano, but some vents had also opened on the upper northeast flank. That eruption had brought a sudden end to the nearly continuous activity that had occurred at all four summit craters of Etna for six years (1995-2001). No glowing lava had been seen anywhere on Etna since 9 August 2001. 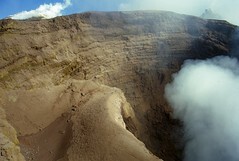 However, deep within the Bocca Nuova, deep rumblings were heard a few weeks after the end of that eruption, and this was again the case when I visited that crater on 30 January 2002. We were standing on the rim of the huge pit in the western part of the crater, and every few minutes a loud bang rose from the tremendous throat, along with a volume of white vapor and bluish sulfur dioxide. The ground was covered with fine, light brown ash, a sign that some ash had been emitted lately, but this was all pulverized old rock, no sign of new magma rising to the surface. In this view, you can see the countless layers of lava and loose (pyroclastic) rock material, which led to the filling of the Bocca Nuova between 1995 and 1999. The steaming peak in the left background is the western rim of the Voragine, and the steep crag in the right distance is what remains of a small cone formed within Etna's former Central Crater in 1964. Not much of the features visible here remain today. Etna remained essentially silent for another two months, then ash emissions started from the Bocca Nuova and the Northeast Crater in late-March and early April 2002. Magma briefly appeared in the Bocca Nuova in mid-June, but more consistent Strombolian activity started within the Northeast Crater in July, and went on through late-September. Etna was coming back to life, and everybody was convinced that it would not take long until there would be another major flank eruption. The eruption of July-August 2001 had destabilized the volcano and ripped its flanks open, and it would not be difficult for new magma to issue through these wounds once more. And that's exactly what would happen during the night of 26-27 October 2002.